So now that I'm totally over 2010 movies, I've started hitting up 2011. This past weekend, I saw Hall Pass, which had a lot of funny moments amidst a rather trite plot and some unnecessarily scatalogical humor. Among the raunchy-movies-with-a-heart genre, it was actually decent and worth a watch if that's your thing. Far more interesting, though, was the movie I had some beers whilst watching - Rubber. You probably haven't heard of this, but it's a really profoundly weird film. It's about a tire. A killer tire. Named Bob. The grand majority of the film is just watching a tire roll around on screen, occasionally stopping to make people's head explode (my assumption is that Bob the Tire doesn't like that we have enslaved his brethren for use on our cars, but that is only implied). There's a lot more to it than that, of course. Bob seems to have fallen in love. And there's an audience watching everything. And some cops trying to catch Bob. Yeah, so really weird. It's a short film and kinda artsy-fartsy, but I loved it. It's available now on a lot of Cable On-Demand services (I saw it on Comcast), and my understanding is that there will be a short theatrical release in early April. Beer Nerd Details: 8.3% ABV bottled (12 oz). Drank from a tulip glass. Rubber sounds profoundly weird...the sort of thing I would have loved at one point. Dunno how I'd feel about it these days. I find the flavor of Simcoe hops really funky and off-putting. 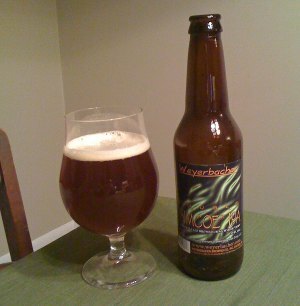 I have had a IPA featuring Simcoe (might have been the Weyerbacher, not sure), and I really didn;t like it. Belgian IPAs, on the other hand, are a really cool fusion of styles, that I tend to enjoy very much. Rubber is certainly... not for everyone. Aside from the Double Simcoe, I don't know what else Simcoe hops are used in, so I really can't say. But I do really enjoy the smell and flavor of that particular beer. I haven't had many Belgian IPAs, but I tend to get distracted by the fusion, making me wish that I had one or the other. A good example would be Ommegang's BPA. It's a good beer, to be sure, but it feels like there are two different beers in there, and neither one seems to come out particularly well. It seems that BPAs seem to be becoming more popular though. Who knows, maybe I'll acquire a taste for it. A few years ago, I wasn't a big fan of IPAs at all, but now I enjoy them quite a bit. When I started this blog, I wasn't interested in stouts at all, but I'm actually coming around. Maybe I'll come around to BPA style beers too! This page contains a single entry by Mark published on March 2, 2011 8:18 PM. St. Bernardus Abt 12 was the previous entry in this blog. Dubbel Feature is the next entry in this blog.